English: A 3rd century BC gold oktodrachmon shows the paired, profiled busts of the co-rulers of Ptolemaic Egypt. 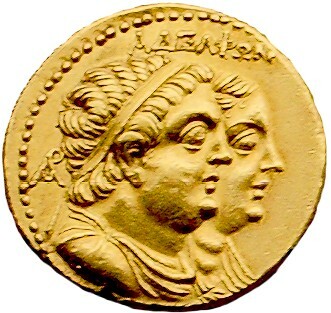 Ptolemy II Philadelphus (285–246 BC; front) wears a diadem and drapery. His sister and wife Arsinoe II (rear) wears a veil. The Greek inscription "ΑΔΕΛΦΩΝ" (adelphōn) means "of siblings".